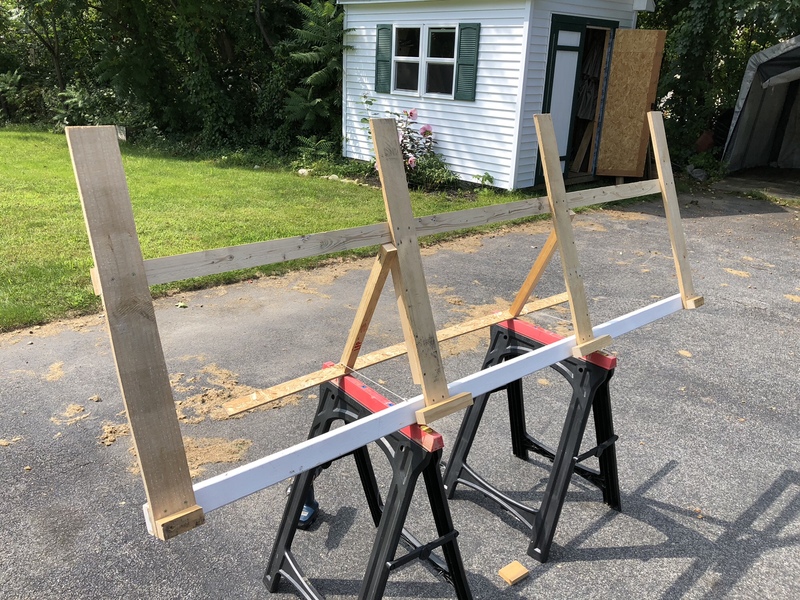 I created a jig for assembling the fuel tank using the templates included with the plans. 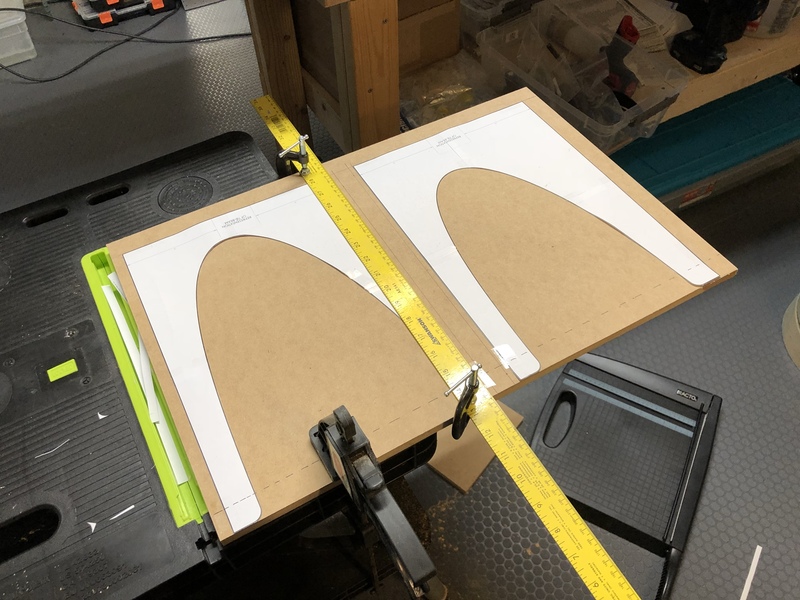 After transferring the profiles to a sheet of 1/2″ MDF, I cut the shape by hand with a rotozip-style tool, then filed and sanded as needed to smooth it out. Next I followed the plan instructions which say to cleco the left side ribs, stringer and skin together before attempting to seal them. Parts mostly went together ok – there are one or two holes I’ll have to modify. 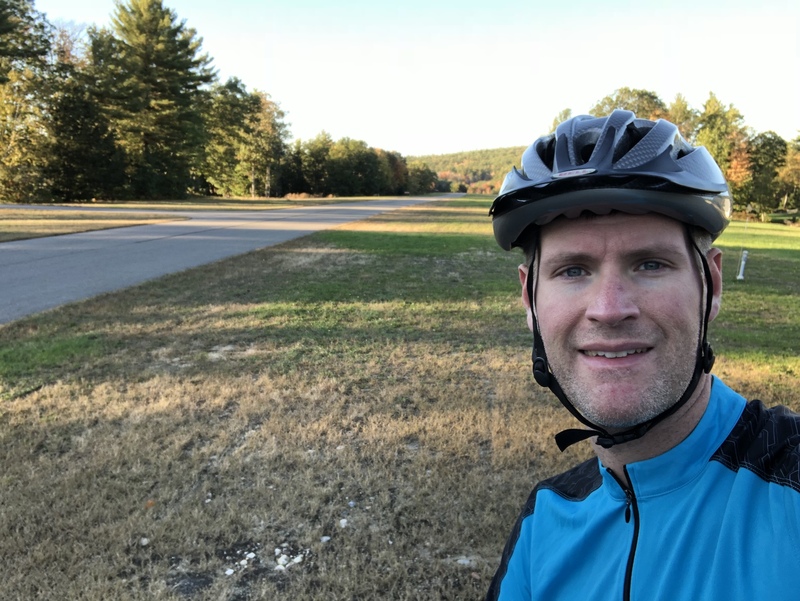 Since it was a nice day, I hopped on my bike and took a ride over to the little airport in town – Brookline NH (NH16). It’s one possible option for a place to keep my plane when it’s complete. 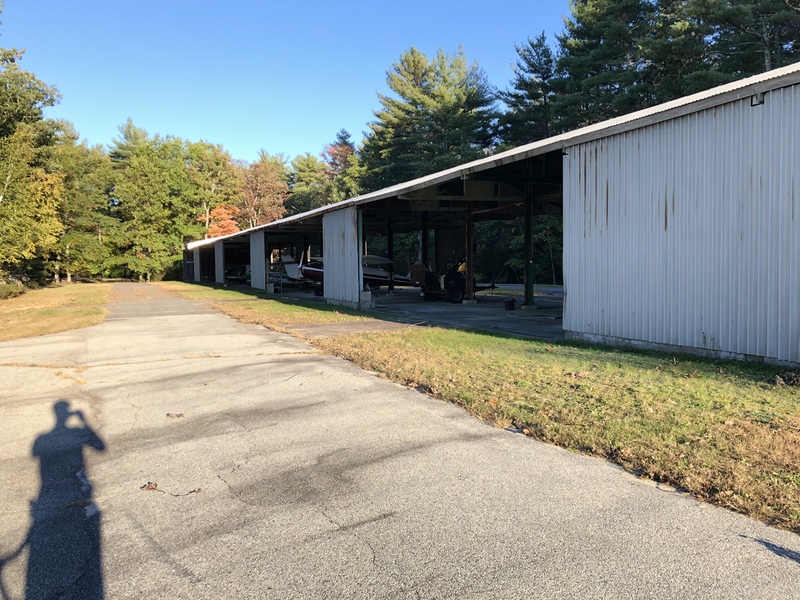 NH16 is a cute little private airfield, with some homes and hangars directly off the runway. 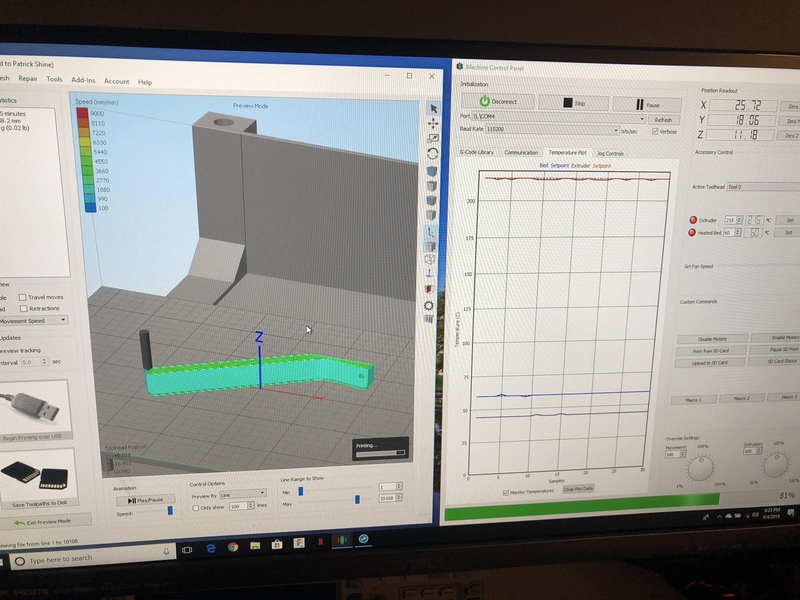 The runway is pretty short though, just under 2000′ long, with tall pines at one end… I’ll have to take a look at performance numbers for the Sling 4, especially the 50′ obstacle clearance run! 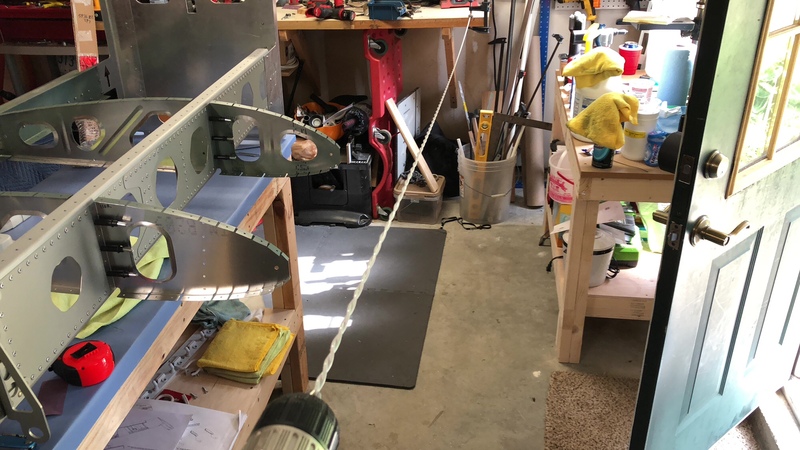 I ordered the little close quarters wedge from Cleaveland Aircraft Tools last weekend, but I’m still waiting for it to arrive. Meanwhile, I thought I’d try making a temporary one out of plastic. 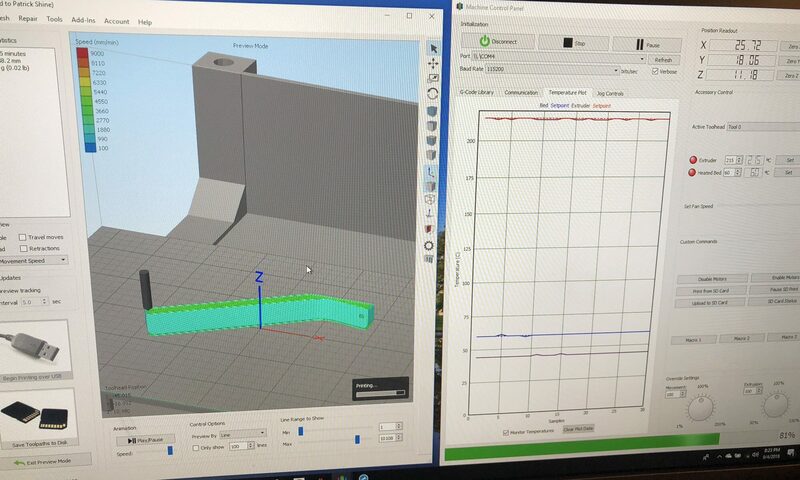 Pretty quick work to design the part in Fusion 360 and then send it to my 3D printer. Looks great, and I bet it’s even pretty darn close to the dimensions of the metal one! 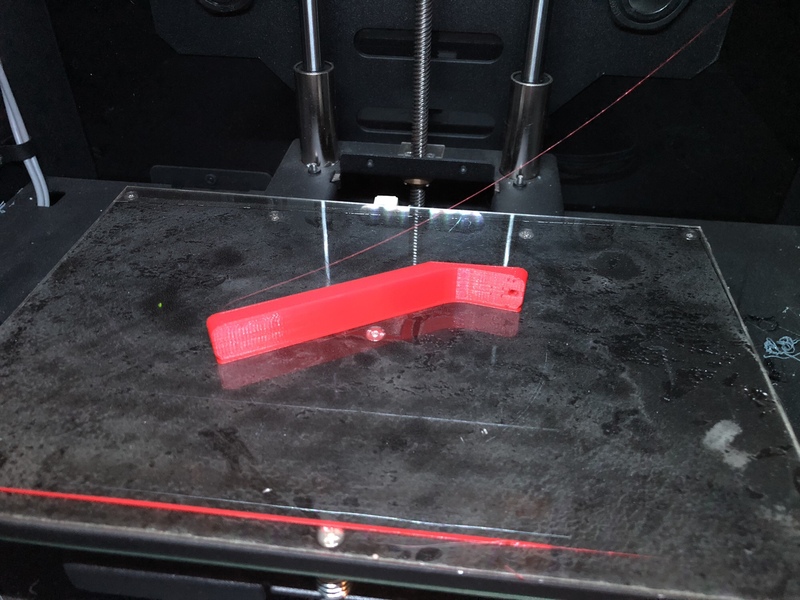 … but it didn’t work so well, it was easily crushed by the force of the rivet puller. I managed to get most of the tough-to-reach rivets anyway without this aid. 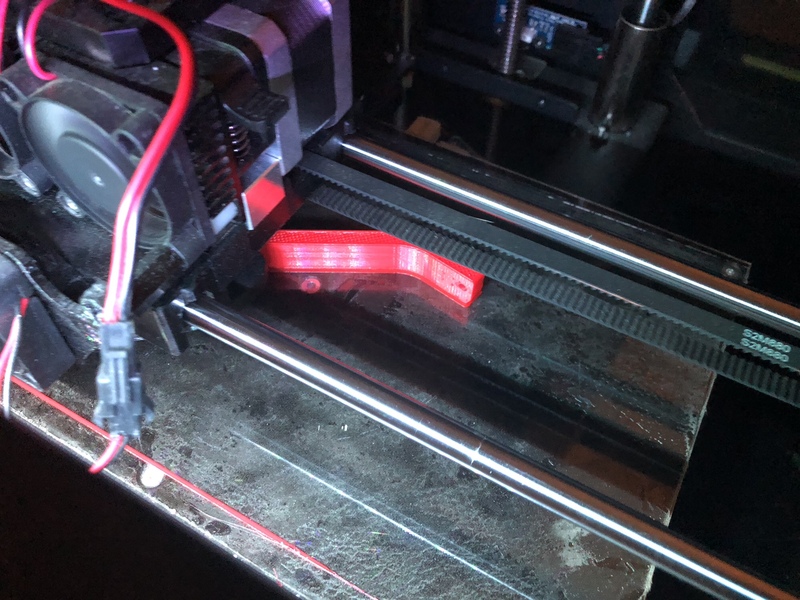 My manual rivet puller has an adjustable head, so I was able to get into the tight spaces. 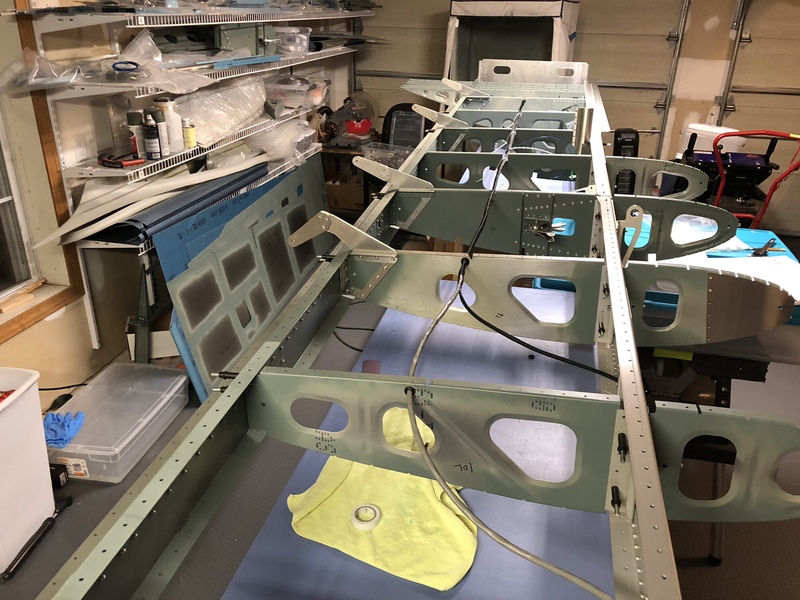 Busy day doing various tasks on the left wing. 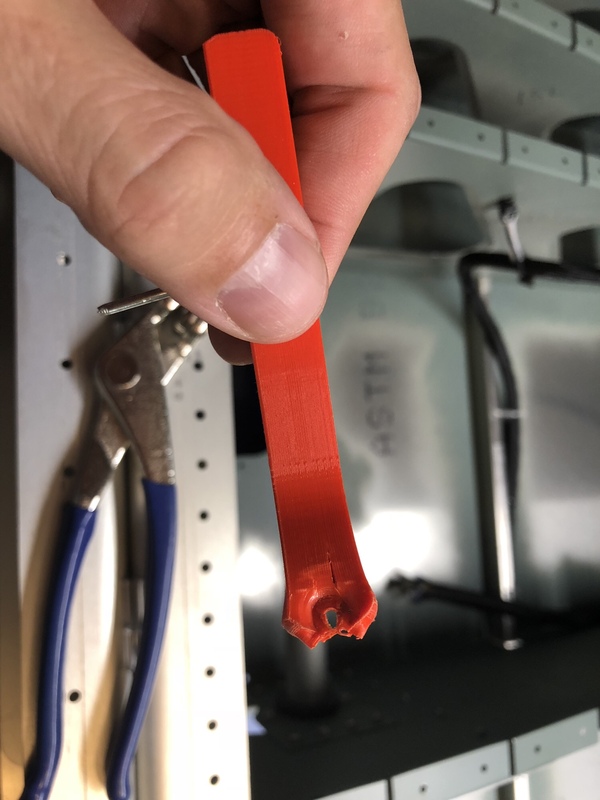 First, I ran the pitot & AoA lines and built the little standoffs per the manual. 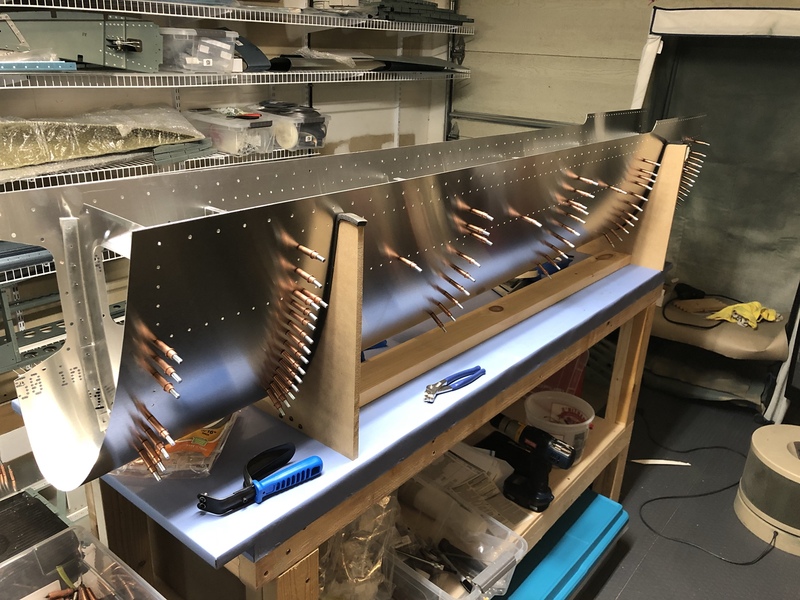 Since it was nice outside, I built a little fixture so that I could prime the inside of the wing skins. I used mostly reclaimed wood from the shipping containers that my kit arrived in. Next up was wiring. 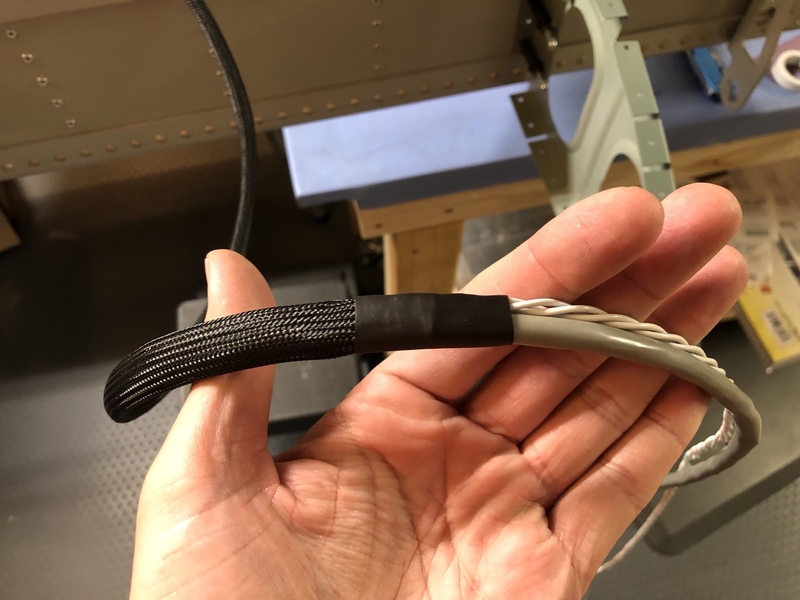 The kit includes quite a few wires already: 6-conductor cable for wing-tip lights, plus 3x individual 16AWG wires for the landing and taxi lights. 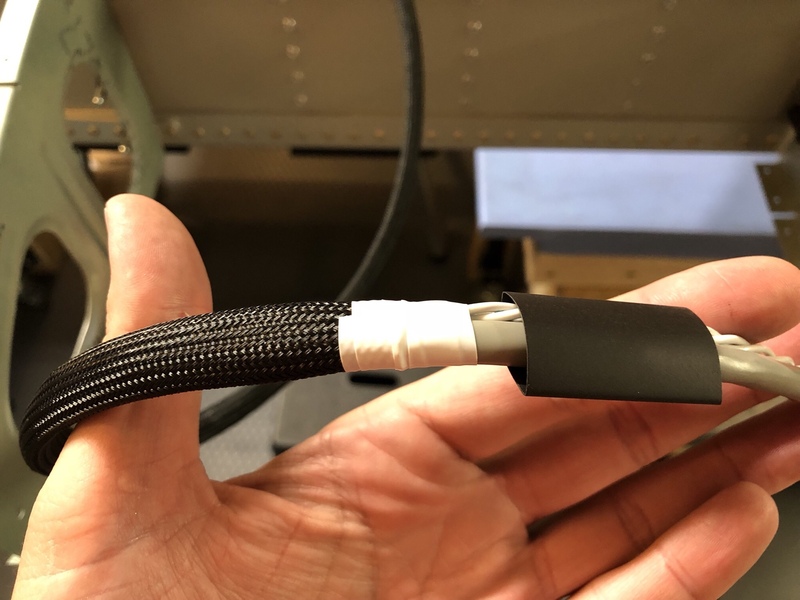 To this I’m adding 2x 14AWG wires for pitot heat and a 22AWG discrete line for the pitot heat regulator. I put these wires all into expando sheathing to protect the wires and keep things neat and organized. 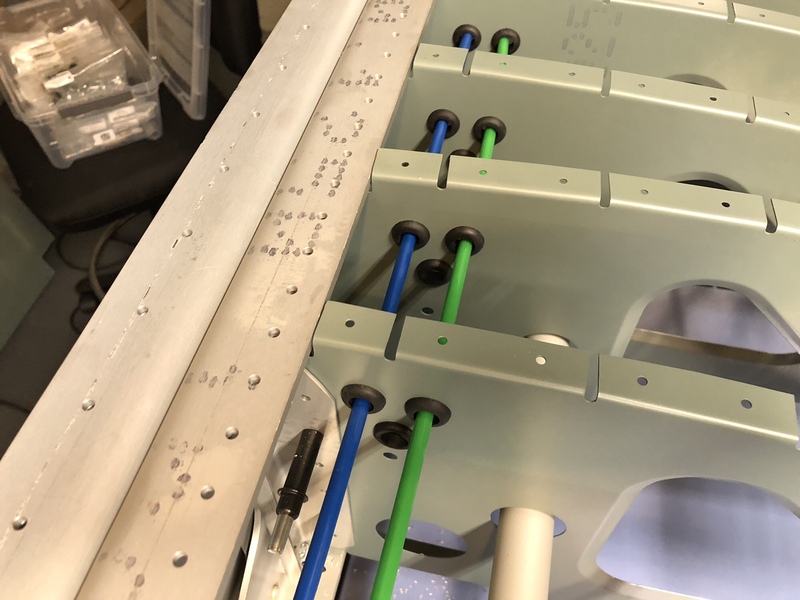 Only problem however was that this cable harness was now larger (in diameter) than I could fit in the pre-drilled holes in ribs 12-16, so I had to enlarge the holes and put in bigger grommets. 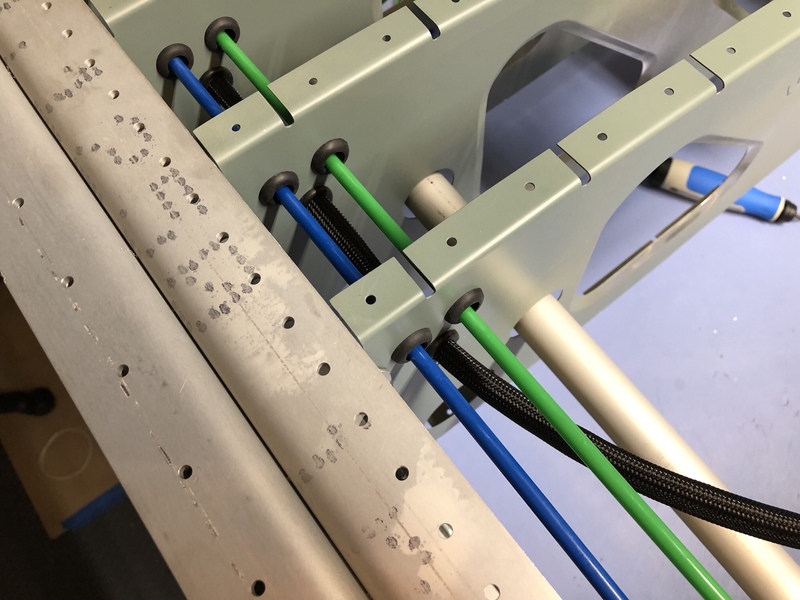 Because these ribs are so closely spaced together, I had to take them out partially, but it wasn’t too bad since they were only held in with a few clecos. 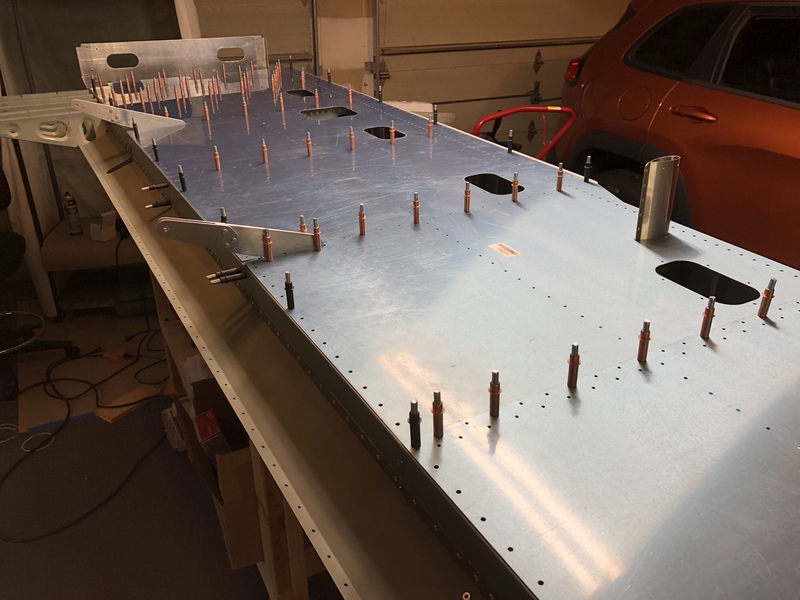 For my last task of the day, I started attaching the bottom wing skins with clecos for a test fit. 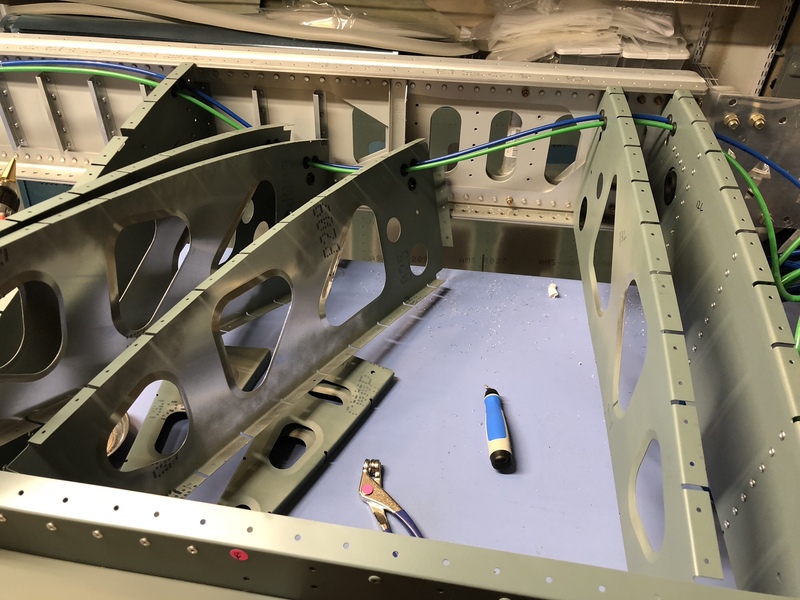 Assuming everything fits ok with all skins on, then I get to take all of the skins off again and rivet the ribs to the spars… That’s a lot of clecos to install and remove! 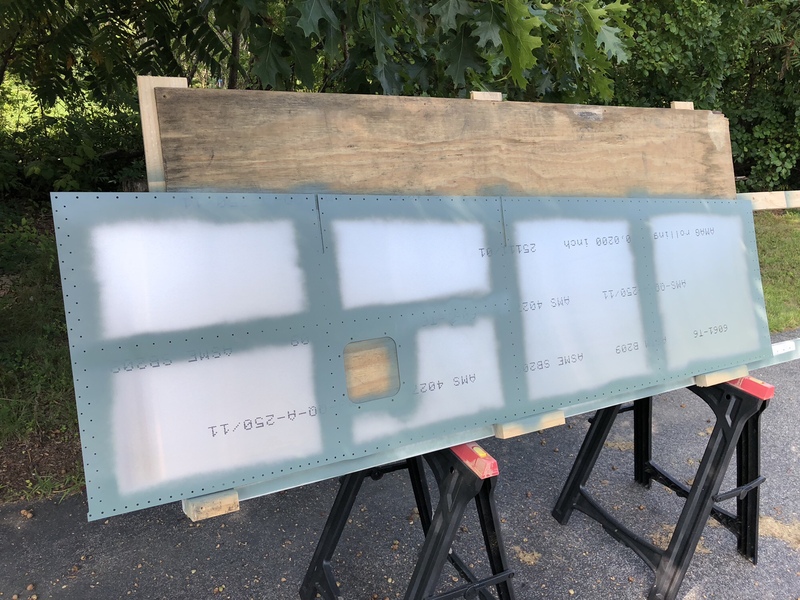 Wing skin #1… So far it’s ok, but it looks like some holes are not lining up right. 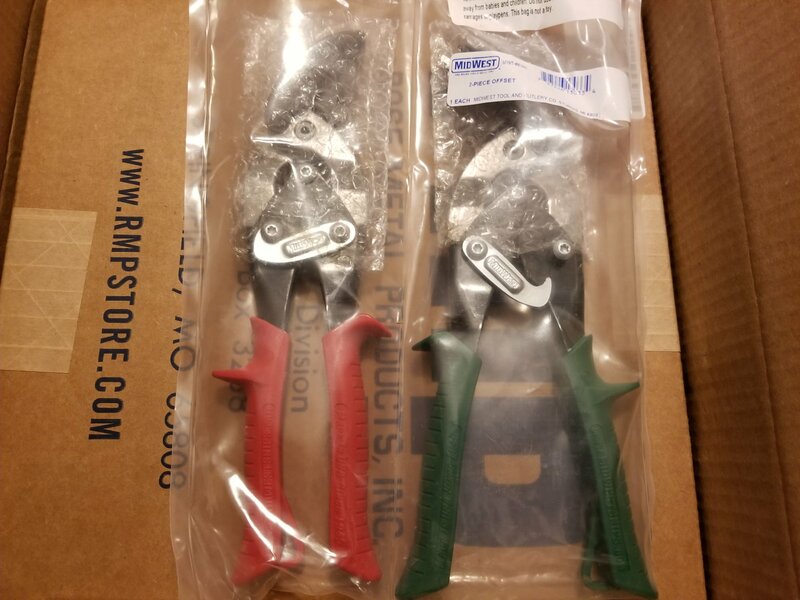 May have to using chucking reamer to open up a few. 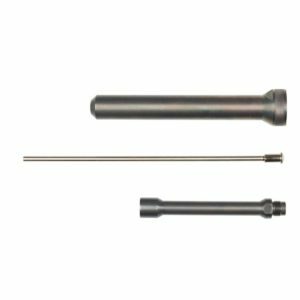 I’m buying a second rivet gun – as I mentioned in my earlier post, it’s pretty common for assemblies to use both 3.2mm and 4.0mm rivets. 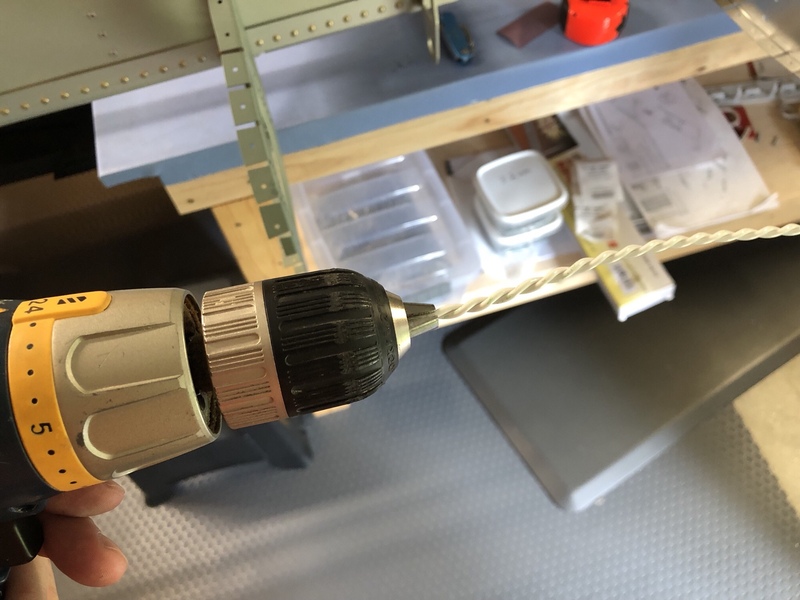 Changing the bit on the rivet gun is a little annoying (even if it doesn’t take too long) – it’s about the same effort as having to un-chuck and then re-chuck a drill bit into a keyed-chuck drill. It looks like the wings use both rivet sizes, and there’s a lot of them, so I think I’ll be thanking myself for this little time-saver down the road. 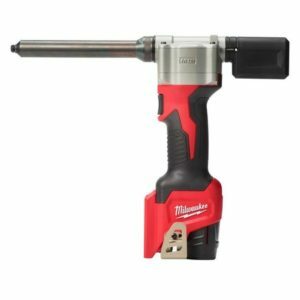 While I was putting this 2nd drill into my shopping cart at Acme Tool, I was pleasantly surprised to learn that Milwaukee came up with a very useful accessory to go with this rivet gun – a 6 in extension for getting into tight spaces. 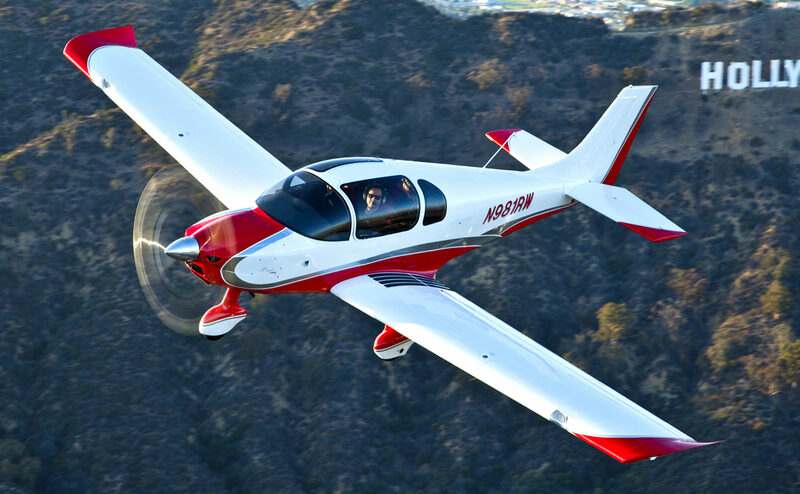 Of course, I’m getting it – I’ve seen plenty of pictures from the fuselage build where I think this will come in handy. 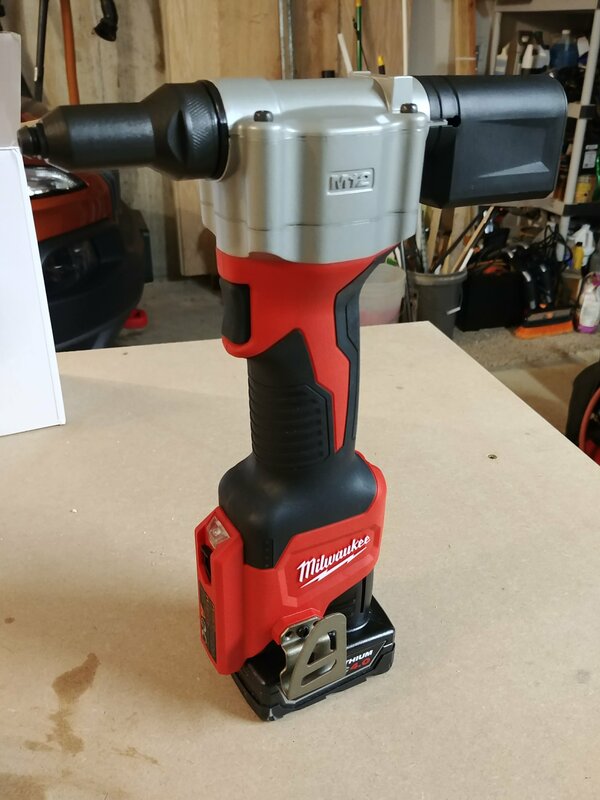 Just in time for my kits arriving tomorrow, I received my Milwaukee M12 rivet gun today! It’s quite substantial, more so than I was expecting. It just came out this past weekend so I must be one of the first people in the whole country to own one. I’ll test it out tomorrow as I await the delivery from XPO. 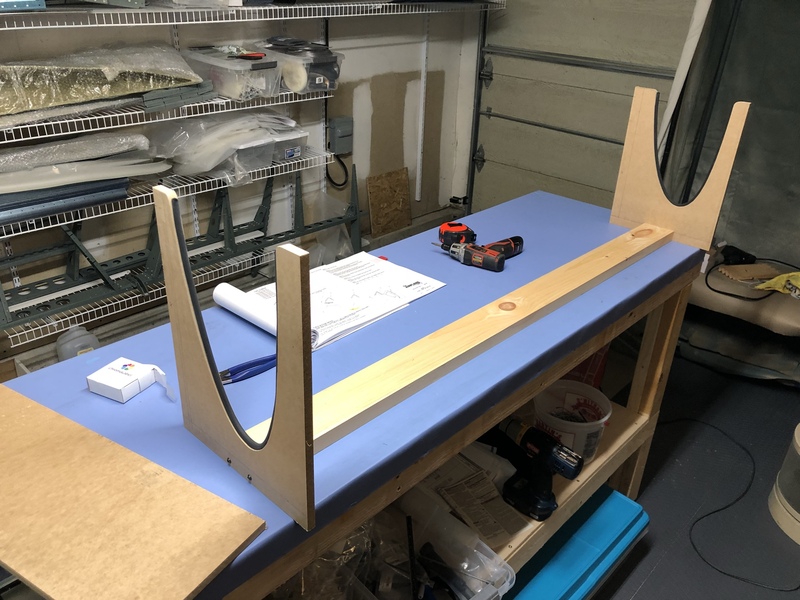 This past weekend, I also hung some wire shelves on the wall as a place to store all the loose parts until ready to be assembled. Looks good, and can be expanded as needed. 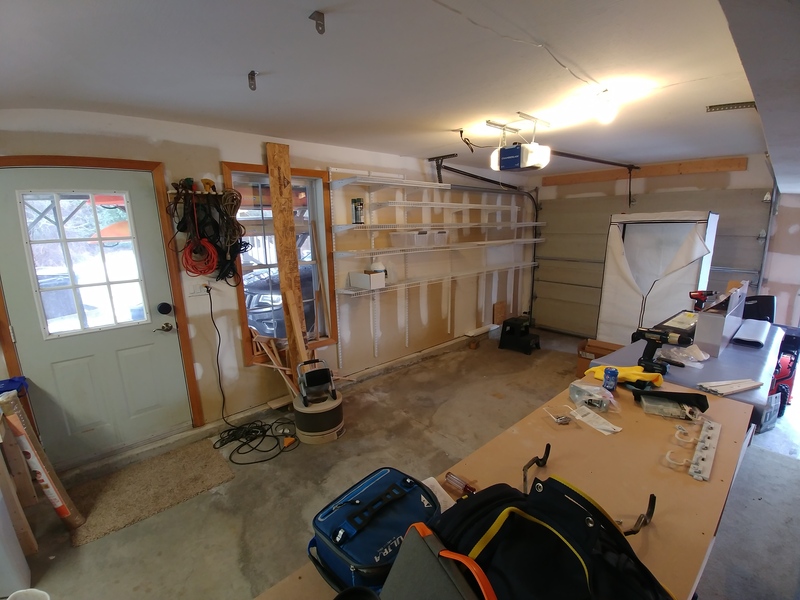 I think I’m ready now to begin – I’ve got all my tools (I think), finished building the workbenches, the work area is clean, well-lit and heated, and I’ve got a smart speaker for tunes! 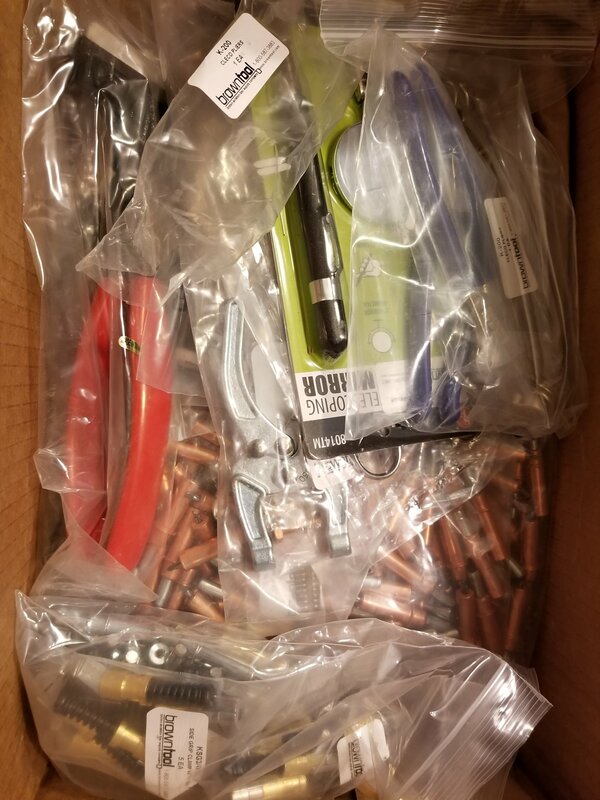 My haul of clecos, drill bits and various other things arrived from Brown Aviation Tools today! Big, heavy box! 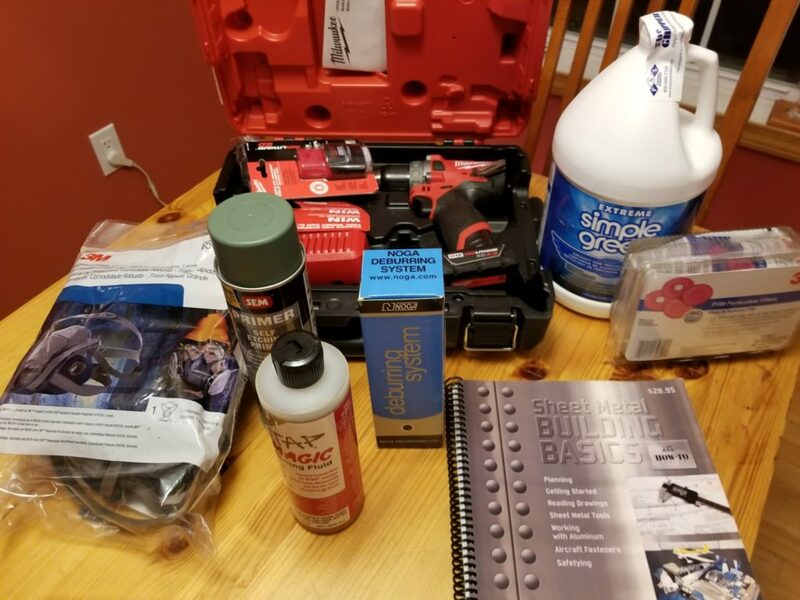 I’ve been ordering a bunch of stuff I’ll need to start construction, thought I’d post a picture of the very first things that came in!